Not long ago, about 80 percent of pellets made in the United States were used domestically, largely for residential heating. Today, wood pellet heating has grown from a residential home heating alternative into an international energy and environmental super-power. Wood pellet exports from the United States have doubled since last year – with more than half the exports going to the United Kingdom. The European Union pellet import increase stems from a goal set to obtain 20 percent of energy from renewable sources by 2020. 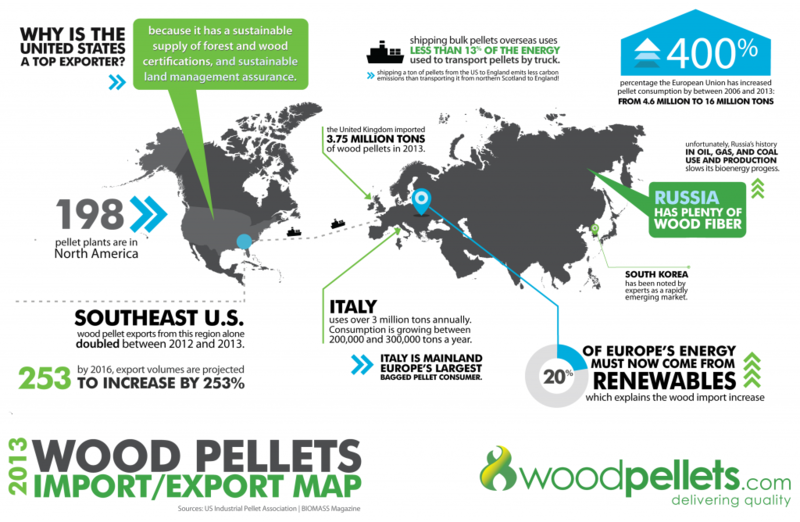 According to the RISI’s 2014 Global Pellet Demand Outlook Study, wood pellet demand globally is projected to grow from an estimated 23 million tons in 2014 – to 50 million tons in 2024. Due to a successful history in American sustainable forest management, the total forest area in the U.S. is within one percent of what it was 100 years ago. Therefore, because Europe does not produce enough timber to meet the high demand, increased imports of wood pellets are coming from the States. The US has substantially greater forest resources than Europe, making it an ideal area from which to source pellets. Ocean freight is substantially more carbon and energy-efficient on a per ton basis than trucking, which means that shipping long distances makes more sense than trucking over moderate distances. Shipping a ton of pellets from the Southeast U.S. to England results in less carbon emissions than trucking that same ton from northern Scotland to England. Fortunately for residential wood pellet burners in America, many new pellet mills have been proposed or are under construction to alleviate the demand. If you’re worried about your own personal supply – check out our blog on how to avoid any potential wood pellet shortages. Questions? Need wood bricks or pellets? Give us a call at 1-800-PELLETS to speak to a Woodpellets.com representative.